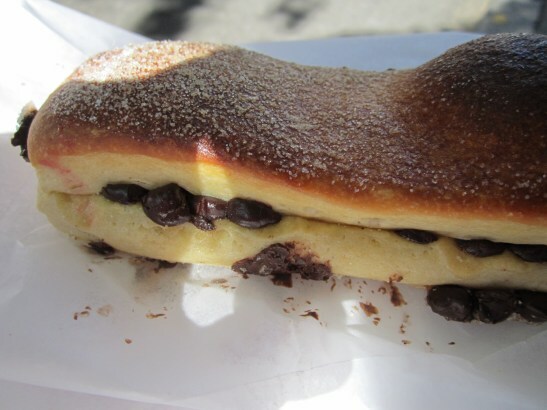 Chocolate Brioche – PUT THAT IN MY FACE. 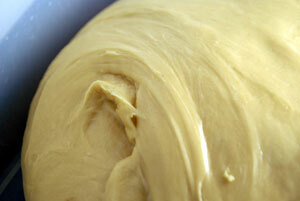 On a floured work surface, roll out the dough into a rectangle about 20 inches by 10 inches and 1/4 inch thick. It will have the consistency of cold, damp Play-Doh and should be fairly easy to roll. Position the rectangle so a long side is facing you. Take your chocolate and cut it up into small chunks, sprinkle onto the top half of the dough. Fold the top half of the rectangle completely over the bottom half, then press down gently so the halves are smooshed together. Carefully transfer the brioche to the prepared baking sheet. Cover the pastries lightly with plastic wrap and place in a warm spot to proof for about 2 hours, or until the dough is puffy, pillowy, and soft. Position a rack in the center of the oven, and heat the oven to 350 degrees F.
In a small bowl, whisk the egg until blended. Gently brush the tops of the pastries with the beaten egg. Bake for 35 to 45 minutes, or until golden brown. Let cool on the baking sheet on a wire rack for 20 to 30 minutes. The pastries tend to bake into one another in the oven, so break apart into 10 pieces. The pastries are best served warm or within 4 hours of baking. They can be stored in an airtight container at room temperature for up to 1 day, and then warmed in a 300-degree-F oven for 5 minutes before serving.